Diuris fragrantissima site maintenance, Sunshine. Hosts Phil & Irene Ritchie. "Pterostylis rufa complex - Bentham's Mistake" presented byBill Kosky. Learn the techniques of growing terrestrial orchids from seed. Caladenia amoena site maintenance, Plenty Gorge Park. Diuris fragrantissima and Diuris basaltica site maintenance, Laverton. Caladenia robinsonii site maintenance, Mornington Peninsula. Three short talks presented by Mike Pielor. Epiphyte study group visiting George and Rosemary Ingram's shadehouse. 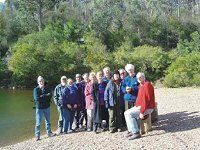 Terrestrial study group visiting the Briagalong area. Conservation group monitoring Pterostylis despectans. New members learn the finer arts of orchid identification from Helen Richards. Seed propagation group members using the Australian Orchid Foundation lamina flow cabinet. Within ANOS Vic there are 4 active groups to cater for members different interests. By being a member of ANOS Vic. you are entitled to participate in the activities organised by any of the groups. The Epiphyte Study Group meets once a month. 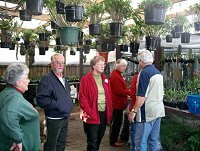 Activities usually involve visiting members and other epiphyte orchid growers to see the conditions they grow their orchids under. The Terrestrial Study Group organises a field trip to search for orchids in the field at least once a month. Trips can range from anywhere in Victoria to the occasional interstate adventure. The Conservation Group endeavours to undertake a conservation activity in the field at least once a month. Typical conservation activities involve searching for rare and endangered orchids, site maintenance and monitoring of endangered orchid populations. 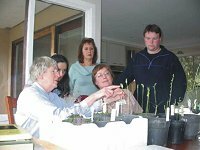 The Terrestrial Seed Propagation Group is a hands on practical group formed to help improve our knowledge of how to grow orchids from seed. The group meets once a month and members get learn the techniques of plating orchid seed. The Australian Native Orchid Society promotes the conservation of native orchids through cultivation and preservation of their natural habitat. All native orchids in Australia are protected in the wild; their collection is illegal. Always seek permission before entering private property.